For something really special, bake a batch of these delightful vegetarian mince pies - box them up as a gift, or wrap them individually and use as stocking fillers or table decorations. Preheat the oven to 200°C, gas mark 6. Place the flour, butter, ground almonds, icing sugar and egg in a food processor and wizz until the mixture comes together to form a ball. Wrap the pastry in clingfilm and chill in the fridge for at least 30 minutes. Meanwhile, place the walnuts on a non-stick baking tray and roast in the oven for 4-5 minutes or until beginning to turn golden. Transfer to a plate and allow to cool, then roughly chop. Peel, core and coarsely grate the apple. Reserve about a quarter of the chopped walnuts and mix the rest with the apple, mincemeat, clementine and Grand Marnier, if using. Roll out the pastry on a lightly floured surface until 3mm thick. Using a 9cm pastry cutter, stamp out 12 rounds and use to line a 12-hole muffin tin. Fill each case with mincemeat. Bake the pies for 10-12 minutes, or until the pastry is just beginning to brown around the edges. Cool for 5 minutes, the transfer to a wire rack and allow to cool completely. To make the icing, mix the icing sugar with enough clementine juice to make a smooth paste. 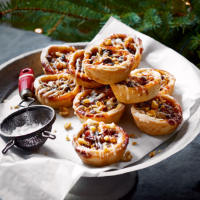 Drizzle icing over each mince pie, sprinkle with the reserved walnuts and allow to set before serving, packing into boxes or wrapping. Dust with more icing sugar if you wish. Make the mince pies as above and keep for up to 1 week in an airtight container. Make the pies to the end of step 4 then freeze in the tin. Once frozen, transfer to freezer bags. To use, return the pies to the tin and bake from frozen for 12-15 minutes at 200°C, gas mark 6, then cool and decorate.